Bolting Bits favourites Rhythm Section are continuing to showcase their impeccable A&R skills with the perpetual search for new and raw talent from across the globe. Next up on the docket for the South London imprint headed by Bradley Zero is a four track EP from String Theory, the 21st release on the label. We struggled to unearth any info on the Glaswegian production duo and there may not be any as of yet, considering this is their debut EP. This gives us all the more reason to dive straight into the music. A four tracker that impeccably nestles itself in among the ranks of Rhythm Section International’s already laudable discography, the “Modularity” EP combines a number of different elements and influences to form a polished selection of tunes. The aptly titled release has a heavy use of modular synthesis throughout the tracks, but that’s not what makes it stand out. It’s the way that it is combined with raw instrumentation and jazzy influences that’s really got us singing this mysterious Scottish duo’s praises. Shifting our focus to the premiere, Con Moto does exactly what we just described. A bouncy rhythm and jazzy chords alongside a blooping modular synth line open this one up until the live bass takes centre stage, strutting its stuff along. This call and response takes place a number of times throughout, all while the different instruments try and take the spotlight from the bass, at times managing to find equilibrium all together. From the swelling strings and chords to the surprise cheeky organ and sultry, squelchy synth line, this is one instrument battle we can’t stop listening to. Needless to say we’re going to be keeping our ear out for String Theory in the future. 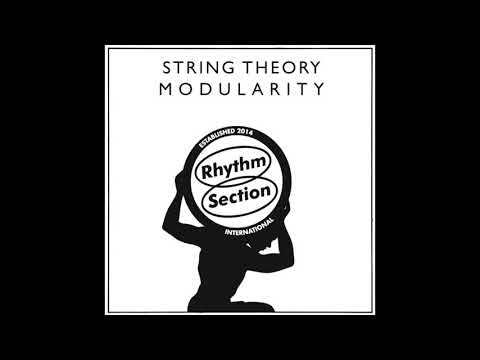 You can pre-order the Modularity EP from Rhythm Section’s Bandcamp.